After you’ve deleted the above code from the HTML file, make sure you link to your swfobject. This is what will be displayed in the event that the end user doesn’t have flash installed. I included a simple image and some text. It’s usually wise to include a link to Adobe’s website so that they can download the flash player if they want to. It’s worth noting that if the user does have flash installed, he will never see this content, which looks a lot more professional than loading the swf on top of an error message. The name of the flashcontent div can be changed to whatever you want, as long as it matches what is in the so.write function. It is necessary to have separate names if you intend to embed more than one swf in the same page. After you’ve done this part, open the page in a browser. If you see the animation, HUGE SUCCESS! I grant you one internet. 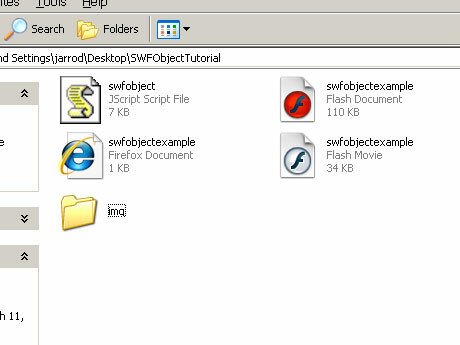 If you want to see what is displayed when you don’t have flash, either remove the swf from that directory, break the url, or better yet, uninstall flash. In order to view the content on this page, you will need the latest version of Adobe’s Flash Player. Hooray! Now the background is black! This is a boolean function that declares the bgColorVar variable. If the variable is defined AND if it is equal to black, the background color will be changed to black. Otherwise, the background will still be white. The background color is actually a movie clip I made, which I then placed on the bottom layer. And that’s how you use SWFObject! See you next time kiddies! I have been granted one internet! Very well explained even for someone like myself who can’t code at all. Works fine but is there a way to turn the background transparent? In the old fashioned way (the easiest for a non coder like me) I always used the wmode parameter. Yes! You can turn the background transparent. Stay tuned for an update to this post! When I embed flash using SWFObject, how can I specify what URL is opened when a user mouse clicks on that flash playing in their browser. Do you mean the link to Adobe?